Inside African Art features Batiks! Not the common boring batiks, but large, colorful batiks that add color and fascination to any wall. Choose from our new selection of large batiks and see them dominate or liven up any wall space. 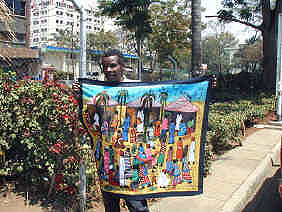 The artist/creator of batiks is a colorful character himself: Richard Kimbo can be found peddling his wares on the street somewhere between the Sarit Center and The Ball Mall, in the suburb of Westlands just outside of Nairobi, Kenya. But he’s only there Sunday through Wednesday, the rest of the time he is busy making his batiks from orders given to him through the week. All one has to do while waiting in the traffic jam is to stick their head out the window and start yelling, “Kimboooo…”, and he will appear! I have known Kimbo since 1989 – the guy is amazing – and dedicated to his craft. He’s really one of a kind. If you are interested in any of Kimbo’s batiks, you can Make an Offer by using the Contact Page or by emailing me at: todd@insideafricanart.com. Or, better yet, go to the Purchasing Page to make a purchase!